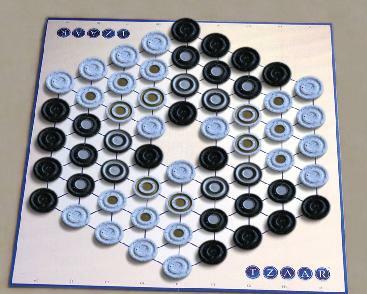 Tzaar is a combined stacking and capturing game. Every turn consists of two moves, the first must be a capturing move, and the second may be a capturing move or a defensive move. You start with different numbers of 3 types of pieces. The pieces all have the same power, but all three types have to be preserved. Overall, a very nice balance of offense and defence is required. The back story: As soon as it was available, Tzaar was an immediate candidate for Boardspace. A no-brainer.